Toys, treats, and training customized for your puppy. A monthly box of all the products and training information you need to be the best puppy parent paw-sible. Toys, treats, chews, and accessories are all handpicked based on your pup's age and physical characteristics. Tell us about your puppy so we can build you the perfect box. Each month your box will change based on your pup's growth and development, introducing you to new products and themes along the way. From the potty training blues, to chewing on shoes and the terrible twos, we will be there for it all. If you don't like a product we will replace it, easy peasy. 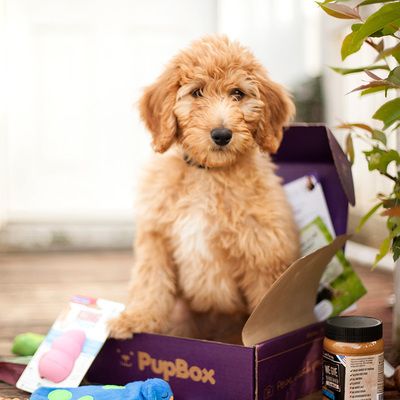 Everything in your PupBox is handpicked based on your puppy's specific needs. Each box includes 5-7 products and a full training guide. * Pup not included Training We let you know what's going on with your puppy and what you should be doing to keep up! Accessories From grooming goodies to training essentials, we get you the accessories you need when you need them. Treats and Chews Meaty training treats and all natural chews are all sourced in the USA! Toys, Toys, Toys Teething toys, plush toys, rope toys, interactive toys and tough toys are rotated based on your pup's development. Created with Sketch. Treats and Chews Treats and all natural chews are all sourced in the USA! Training We let you know what you should be doing to keep up with your pup! Toys, Toys, Toys Toys are rotated based on your pup's development. Accessories We get you the accessories you need when you need them. Loving my first PupBox !!! It has great advice and tips for this lil 5 month old "dogzilla." The treats and toys are perfect for him. Do you have clairvoyant powers? Are you some sort of wizard? This box was on top of my teething woes and has worked miracles! Thank you, thank you!! Really impressed with the quality and selection. There were things I didn’t even think about which I appreciated. The teething items were great because I was not prepared for this stage. Love everything in my PupBox! They give you toys and treats that fit your EXACT age. PLUS, they give my mommy a training and development sheet that highlights all the things going on with me teething advice, socialization skills, training tips. Tell us about your puppy so we can customize your box. Sign up for multiple months and save some chedda. We Of-fur Lots of Options.